Great experience. Friendly staff and even nicer cabin owner. We were snowed in and he was amazing. Called us directly to check that we were OK and even called neighbors to have them watch out for us. Two waters cherry log has by far the greatest neighbors. That mountain is full of the friendliest most amazing people. My faith in humanity has been restored. We were looked after and even invited to dinner after being trapped by heavy snow and ice. The owner himself called in to check in on us and I can only hope we return soon for another visit. My family lived our stay and we really love the people. Felt like home. Made my reservation on the phone with Amy and she was wonderful to work with. We loved our stay in our cabin and will be back for sure. I dealt with Kim. She was very helpful and also very nice. Everyone is always so polite and friendly. They are always willing to help and answer questions no matter how many or how many times they have been asked the same questions. It is refreshing to have such AWESOME customer service now a days. Sky's the Limit was an amazing cabin. Perfect for all 11 of us. Had many extras that all cabins do not usually have. ( Spices, oil, sugar, cooking pots and pans, bowls, ALL the conveniences of home. EVERYONE commented about the comfort of the beds. ZZZZZZZ No expense was spared in this place, will definitely be back. The stay was perfect, exactly what we had hoped for! The staff was very nice and friendly. My family's stay at the Crow's Nest was amazing! This property is everything plus more. The view was spectacular and the cabin was more then words can express. 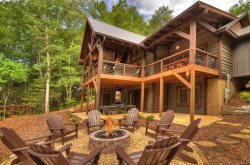 My family and I have been vacationing with southern comfort for years now and I must say they still continue to amaze me with such friendly staff and beautiful cabins. This little home was so adorable! It was walking distance to everything in downtown Blue Ridge. The decor was amazing. It was even decorated for Christmas! I hope we can visit again soon. It was an awesome experience...we will be back to the Moon Kiss!! Amy is exceptional. Her personality and desire to assist was very much appreciated. I enjoyed talking with her. We all had a wonderful time. The cabin provided us with a beautiful setting for our family Christmas. We will definitely consider coming back for future celebrations, and would look forward to engaging with the Southern Comfort team during our planning. All members of your team were wonderful. The cabin was decorated for Christmas and we really appreciated that. It was a great surprise and it made our stay!! We had a wonderful time and our dogs enjoyed the fenced in area. Our cabin was perfect! It couldn't have been any better! Lovely place to visit. We will definitely be back! The staff was so friendly and welcoming! They even called the next day to make sure everything was good. Suite 2 was everything. I knew from the pictures it was nice but when I actually saw the property I was so amazed. I even took pictures because this is exactly how I would LOVE my future house to look...well decorated and more! Love it will definitely recommend! Members were very friendly and accommodating. The cabin was absolutely beautiful. Kitchen was fully equipped. The fire pit was the a hit for Christmas Eve festivities. The basement made a great retreat for the children, and the guys to watch football. Loved the secluded location of this property. We truly enjoyed our stay! Everyone was so nice. While we were there we saw many cabin rental places. I'm like nope. The customer service we received is what keeps me loyal. While walking around town we even stopped in to ask a question and we were treated like friends. We will be booking a family trip this coming summer with the children and my 2 younger twin brothers. So I can't wait to start shopping for that one! Thinking we need to be on the water because it will be warm and we want to fish. You guys were outstanding! Very Helpful and welcoming!! This cabin is so beautiful. Completely our style. Everything was perfect even down to the movies. It met every expectation and more. This cabin will forever be special to us and we will definitely be booking this one again. Like for anniversary's. :) Thank You for the incredible experience. Check in was a breeze! The gentleman I spoke to was very friendly and went over everything thoroughly. It was a nice experience! Incredible - beautiful, clean and exactly what we wanted. Exceeded expectations. It was amazing I can honestly say I got plenty of rest I will do it again and soon.